I love a good statement earring, but I know that they are super trendy right now and in a few years I'll look back and wonder what I was thinking. 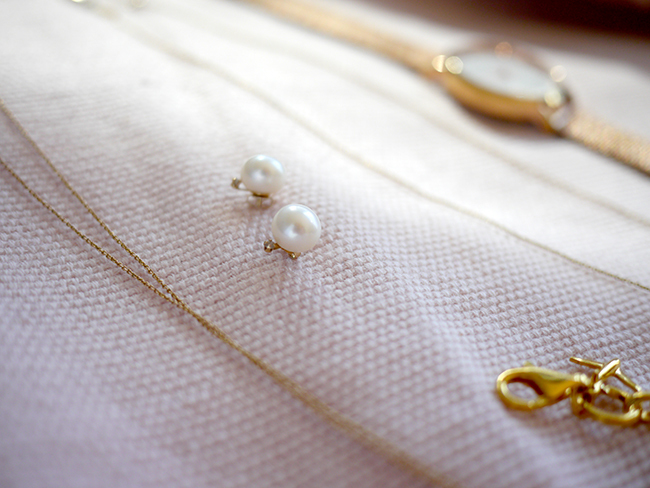 My favorite jewelry pieces that I reach for almost every day are classic, simple, and beautiful. I know I'll have these for years to come, and they won't ever be relegated to the hooks in the back of my closet (ahem, like my statement necklaces from 2013). These are also the pieces I always travel with so I don't have to bring a ton of jewelry with me - I know these will go with everything! I wear pearl earrings almost every day, and I love that they're so classic. These studs were a gift from Jeff a few years ago, and I love that they're large without being obnoxious. 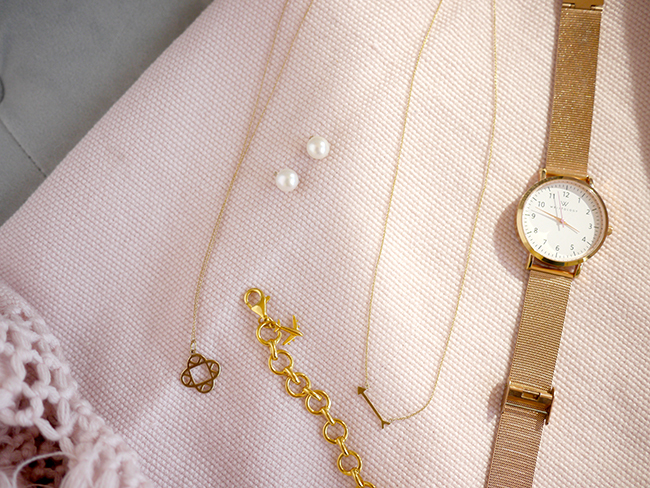 They can make a statement on their own, but they also mix well with any other fun pieces I want to wear. I actually bought both of these necklaces for myself a few years ago. When I got the arrow necklace, I remember thinking it was so expensive and basically kicking myself for spending so much on one piece (ahem - it's $59.00 - not expensive!) but I think I bought it over five years ago now and wear it at least once a week - often more. So really, it was so worth it - especially since my cheaper necklaces have not stood the test of time! I'd rather have one nice necklace that I'll wear forever than a bunch of necklaces that lose their finish or break easily. 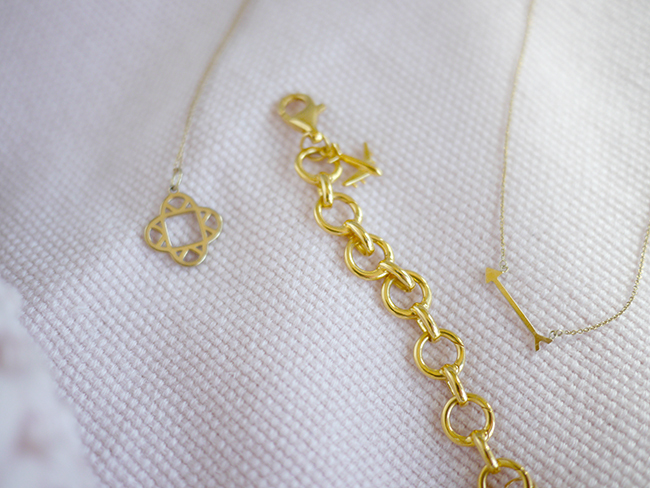 The clover necklace is actually a take on an initial necklace - those are "K's" in there! I bought these little charms along with matching chains for all of my bridesmaids for my wedding, and then ended up getting one for my mom down the line too. It's fun because I wear this almost every day, and when I meet up with friends it's likely that someone will be matching me. This charm bracelet is a recent addition to my jewelry collection - Jeff bought it for me for Christmas. The bracelet itself is beautiful in itself. Right now there's just one little Eiffel Tower on there for our trip to Paris, and I can't wait to fill it up with charms from all of the places we've been and the adventures we have yet to go on. This watch is more of a costume piece, it's definitely on the cheaper side. I got it for Christmas this year too, and I've been really impressed by how it's held up so far. The finish isn't wearing off, and I haven't had issues with it giving me rashes or anything (something that often happens for me with cheaper metal watches). 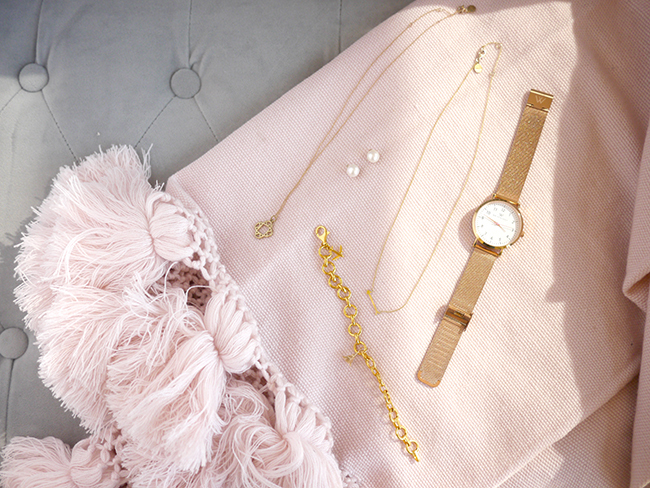 I love the rose gold too - it's fun to wear every day, but still pretty enough to wear with dressier outfits. Since I'm traveling this week, you had better believe all of these pieces made the trip with me! What are some of your favorite jewelry pieces?